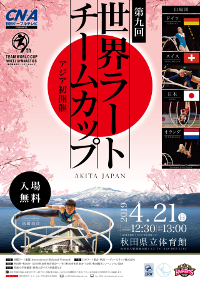 On Monday, 2016, June 20, the 12th World Championships of Wheel Gymnastics and the 3rd World Championships in Cyr Wheel are opened in Cincinnati, USA. Starting Tuesday (21 06.) with elite's all-around competitions until Saturday, June 25, 2016 World Cup competitions took place daily. After Chicago 2013 the 10th Wheel Worlds, now for the second time the world championships of wheel gymnastics are held in the USA. ►► German website only ...!